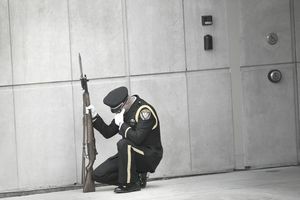 Any time a police officer loses their life in the line of duty it is a cause for mourning. Law enforcement officers around the world will tell you there are few events sadder than a fallen fellow officer's funeral. And while much is made of law enforcement line of duty deaths, there are other dangers lurking for officers that are just as sinister—although far less talked about. Chief among those dangers is law enforcement suicides. There are many assumptions made about the day-to-day life of a police officer and what it does to a person's psyche. With those assumptions comes the belief that police suicide is a rampant problem. But inflated suicide rates are not the only myths and assumptions made about self-inflected officer deaths. Others include the unsubstantiated belief that police divorce is more prevelant, or the idea that alcohol and drug abuse occur more frequently among officers. Most of these beliefs are false, and in the least, unsubstantiated. Instead, they're based on perceptions, stereotypes and misunderstandings of the profession. This may include the idea that police departments under report police suicides in an attempt to cover them up. This is not to say that the number of suicides by police officers is not concerning. In fact, a study by the nonprofit Blue H.E.L.P. puts police suicides at more than 160 for 2018—having rose for the third straight year. That's nearly triple the rate of officers killed in the line of duty, per a 2018 Ruderman Family Foundation study. The rate of police suicides is significant when you compare it to the line of duty deaths. So significant, in fact, that police suicide has been labeled "the other line of duty death." Are Police Suicides More Prevalent? While studies put the suicide rate for police officers at around 23 per 100,000 officers, the rate of the general population is estimated at 14 suicides per 100,000 people, based on Centers for Disease Control figures. Law enforcement officers, then, can be said to be over 1.5 times more likely to commit suicide than the general population. By comparison, military member suicides are roughly 30 per 100,000 members. There is a lot of speculation as to why law enforcement officer suicides are higher than others, including those we've already discussed—alcoholism, depression and divorce. In truth, those issues may only be symptoms of a bigger problem: post-traumatic stress disorder (PTSD). The truth is, an average law enforcement career is well-suited to produce PTSD for some officers. Between the long hours, the fatigue, the potential health issues and trauma, it is easy to understand how PTSD may contribute to higher suicide rates among officers. Figures from the Ruderman Family Foundation has found that roughly 35% of police officers experience PTSD, compared to 6.8% for the general population. As well, roughly 12% of officers experience depression, versus 6.8% for the general population. No one can fully understand why an individual might choose to take their own life. But experts recommend implementation of mental and physical wellness programs, employee assistance services and peer support systems.